Being a LES Indian isn't all that bad, especially if your name is Indie Anne! Indie loves keeping cozy and warm this winter at LES. She finds all the best spots to nap! The students continue to love, hug, pet, and wave at Indie. 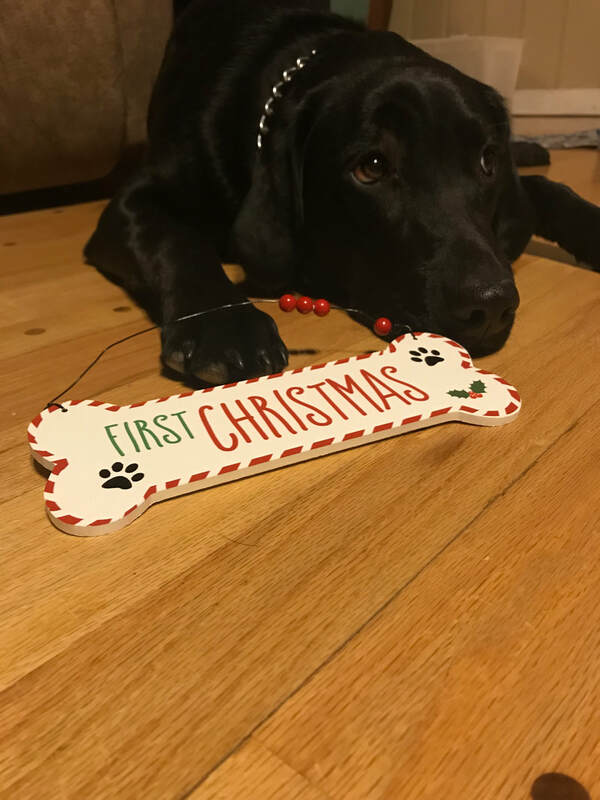 Indie is keeping warm this winter with all the love from LES students and staff!--- Enjoy the slideshow below by pushing the play button! These two pictures really say it all. 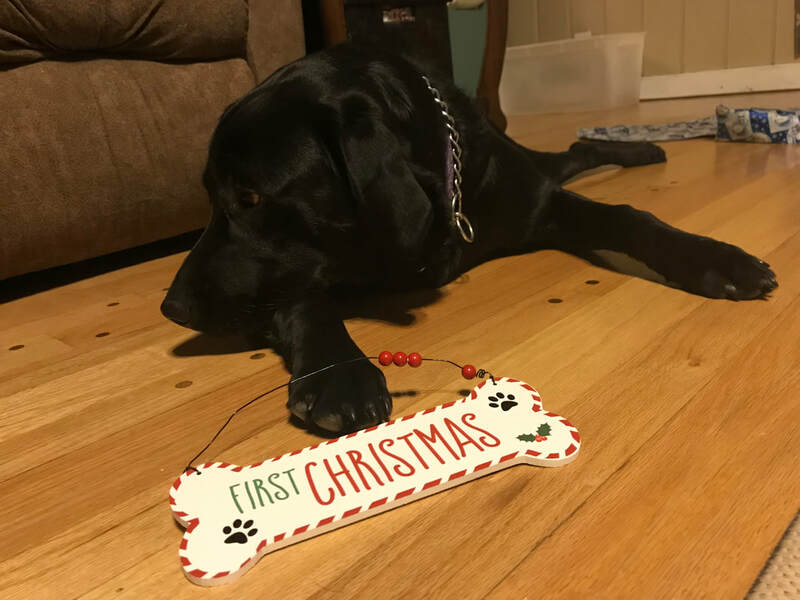 Indie would have rather spent her first Christmas at Fort Larned Elementary school with her LES family, than with her home family. I am not surprised of Indie missing her LES family. She knows that everyone at LES is important! Indie sure puts on a cute pouty face! I know Indie and I were not the only two missing our LES students during Christmas break. All of us at LES hope that Santa brought our students the presents they wanted, had time to play, relax, and time with their loved ones. Indie absolutely got all of the above! In less than 12 hours Indie will be thrilled to see her students smiling faces. I will not be surprised if the students will be smiling back at Indie. Indie is looking forward to some extra belly rubs and treats tomorrow. Indie will probably have the same morning as many of us will tomorrow. It might be slow moving, but once we get to school, it will all fall back into place. Indie is wishing you a great first week back to school and a Happy New Year!!! unicorns and snow, Larned Elementary is a magical place! Indie was very popular among the girls and boys at LES on Halloween. Indie was a unicorn and I was her unicorn tamer. We had a very fun time on Halloween! Indie enjoyed seeing all the other unicorns in the building as well as all the other costumes! Everyone looked great! Download the file to the right to watch Indie play in the snow and trying to catch snow on her tongue! ​It was an exciting day back in September! Indie posed for her first school picture! Her pose was presidential and pristine. She took this memorable opportunity to find just the right pose, making it somewhat difficult for her helpers to understand just quite what she was doing. She knew all along where she needed to be and how she wanted the finished product to look. Posing for the camera is nothing new for Indie. But this pose would go down in the history books of LES and she nailed it! We wouldn't expect any less from our beautiful Indie Anne. Indie visited students at the library for a week in October. The librarians read to the students of dogs who help. Students also enjoyed looking at Indie's blog. 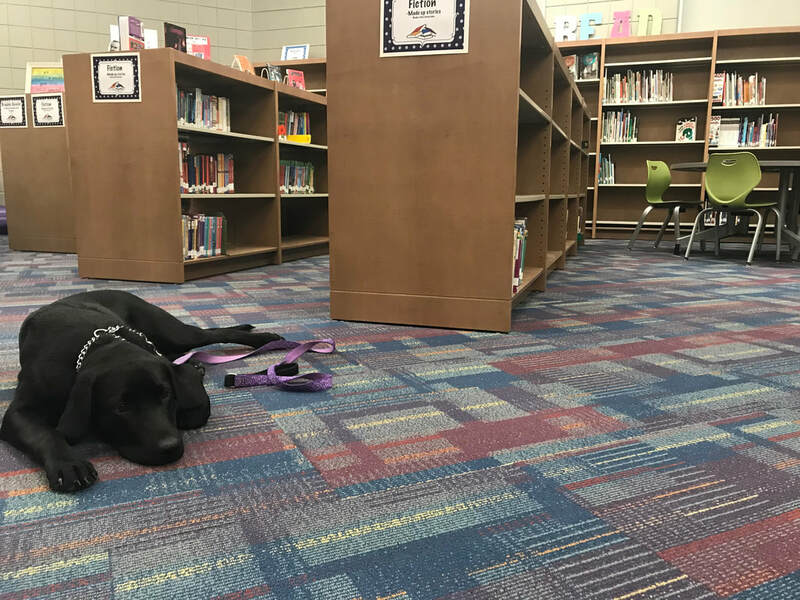 Indie enjoyed meeting students while they checked out their library book. It was a fun, busy week for Indie!! 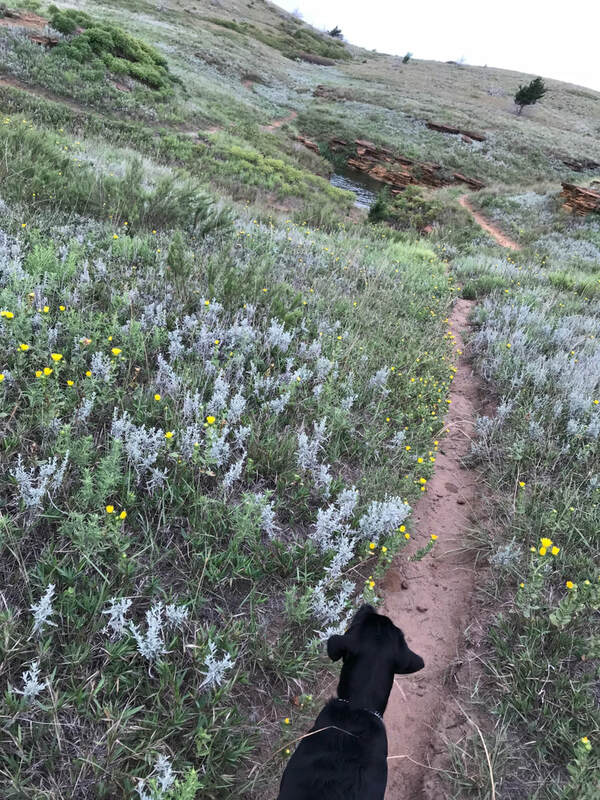 Stay tuned for Indie's next post! What will she be for Halloween???? It is always fun to hear students interacting with Indie. I especially enjoy hearing a student say to Indie, "stop looking so cute," as the student is petting Indie. This phrase and the students expression on their face always puts a smile on my face (and Indie's face too). Not only are common phrases coming alive when petting Indie, but nicknames for Indie are becoming popular. Indie 500 and Lazy Bones Jones are just a couple of nicknames for Indie that make me laugh. Indie has become quite the staple at LES. If I am walking down the halls of LES without Indie, students are asking, "where is Indie?" Just ask your student this same question and I am sure they will know the answer. The answer is that she's sleeping! Indie does enjoy her morning and afternoon naps. I guess it is all working out because if a student wants to see Indie, its will be a relaxing time for them both. Indies recent success story at LES is of a student not wanting to go to school. The student saw Indie waiting for them and the student had no problem getting out of the car to meet Indie. The student and their family were happier knowing everything was going to be okay. The day was off to another good start! No matter sleeping or awake, Indie's success rate of bringing happiness or calmness to LES continues to boost. Students are no different than Indie in helping with the success of LES. Students help remind LES staff to slow down. No matter if the student is in a hurry to get to class or to leave school, they always have time to pet Indie. I know, Indie is popular, but its nice to see the students willingness to put their own agenda aside to focus on what makes them happy. Remember in the busyness of life, slow down to do what makes you happy!! Download the file below to see what makes Indie happy! "WHO ARE YOU AND WHERE'S INDIE?" I was at a community event recently, without Indie, when I told a student, "hi." That student excitedly asked me, "Who are YOU and WHERE'S Indie?!" This moment was amazing and exciting for me (I was also laughing so hard), because Indie had done her job and made a special connection with a student in one week! 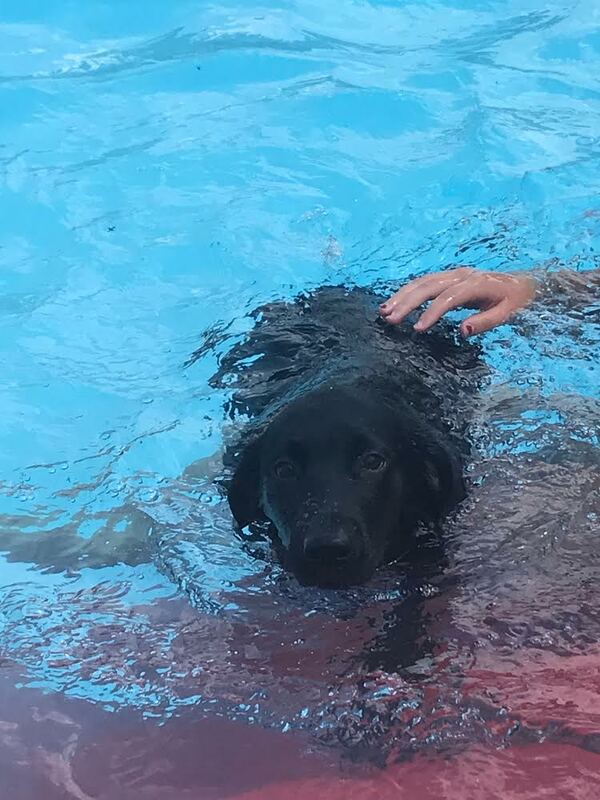 At that same community event I had many students ask, "Where's Indie?" 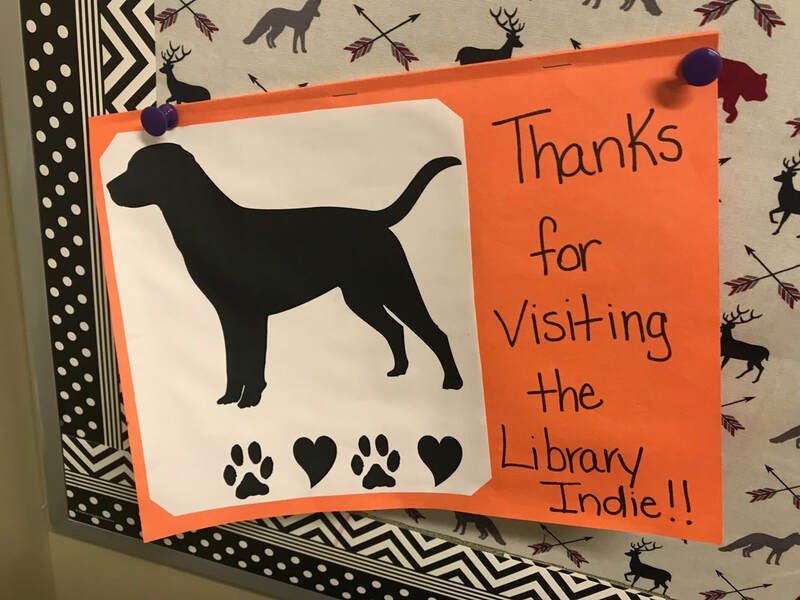 It's very exciting to know that many students have made a connection with Indie. She has been supporting students with all the emotions that come up during the first week of school; happy, sad, fear, anger, disgust, and surprise. She definitely is an effective coping tool for students and staff, no matter their current emotion! 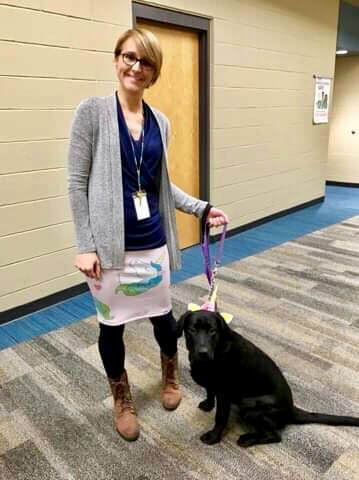 Indie's typical school day is busy with greeting students and staff in the morning, getting belly rubs from students during the day and seeing the students home when the school day ends. In between seeing students, Indie slips in a nap or two, or three, or four. Indie is a very lazy puppy! Okay, so "where was Indie?!" Our little Indie Anne was at "respite." Respite is a place to go to get some rest. No better place to catch some rest than the principal's home! I have a feeling Mrs. Harding and Indie both were taking advantage of respite! We already need respite after one full week of school? Yes! This week is busy and many emotions turn up! Making time to rest and relax to prepare for the week ahead is beneficial so we can perform our best! Now that Indie is well rested, she will be ready and excited to see Mr. Wilson on Monday morning! Every morning her and Mr. Wilson have fun greeting students as they enter the school. I know there will be more connections made this week, and the learning and fun will continue as it always does at LES!!! When is the next school break? In the back of our heads some us might be thinking, "when is our next school break," as we frantically and excitedly prepare for the 2018-2019 school year. Speaking of preparing, Indie has been very busy preparing for her final exam, the first day of school! Her semi-final already took place at enrollment and she did phenomenal! She met many students and found that they give good belly rubs! In many ways, Indie has a lot in common with most students who are preparing for this school year. There will be new students, preschoolers, and kindergartners that will become part of our Tribe for the first time this year, just like Indie! Indie will be quite surprised come Thursday when she sees students at school! Imagine the students surprise when they see Indie at school! The moment will be memorable for everyone. Even if you are a fifth grader who has been in the school district ever since you were a kindergartner or if you are a new student, it doesn't matter, we all are excited for a new year, a new beginning. We all (students and adults) have expectations and anticipations going through our head for this upcoming school year. Sometimes these feelings can make us anxious and we might begin to have butterflies in our stomach or frogs in our throat. If this is the case just know we are all in this Tribe together and will support one another! 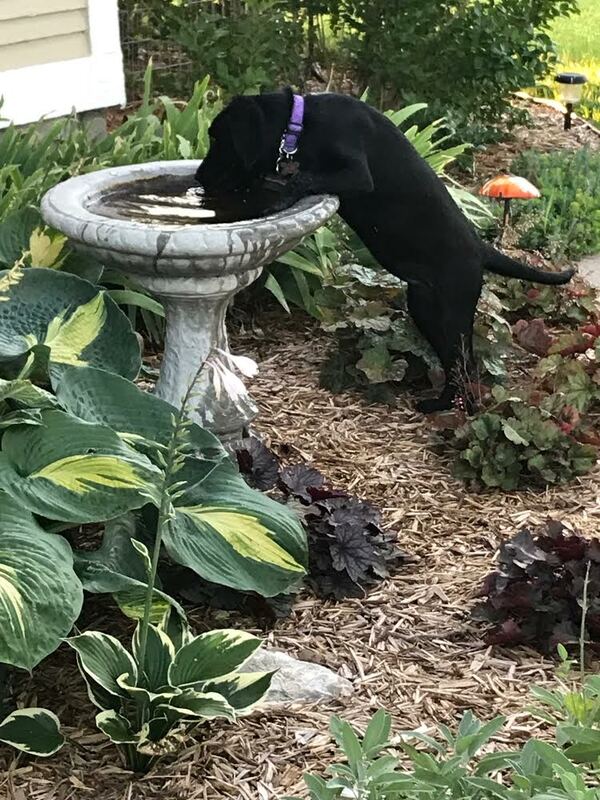 If you need to grab a quick drink of water, go for it! Water is the best way to wash the frogs down and to settle the butterflies! For those of us who have no worries for the first day of school, you are an inspiration! 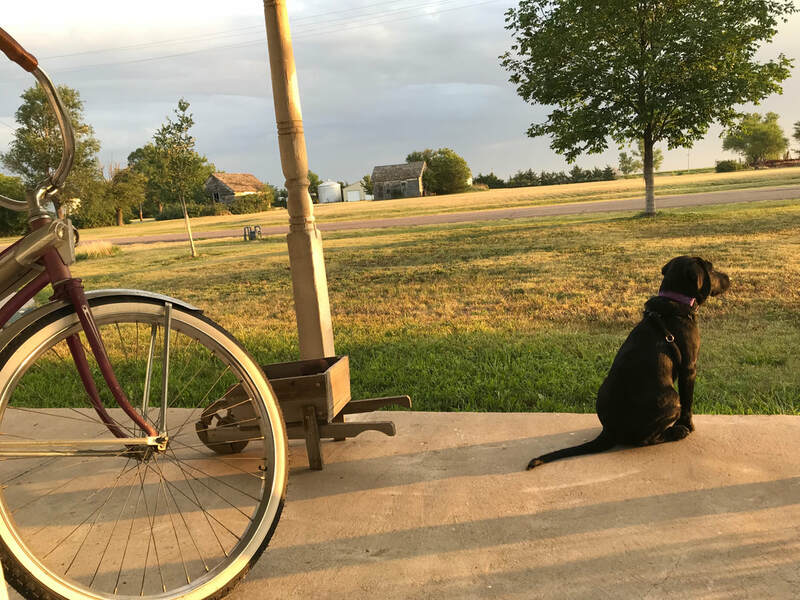 In closing, Indie and I are looking forward to the students and staff members in the Fort Larned School District in having a safe, healthy, incredible learning experience for 2018-2019 school year! Go Indie Anne, oops I meant, INDIANS! !